The world-famous Transfagarasan Highway in Romania is said to be one of the most beautiful roads in Europe, possibly in the whole world. We drove along the Transfagarasan during our visit to Romania a few weeks ago and loved it. I decided to create a concise and detailed guide about this fantastic road trip. Wherever we travel, we make a point of traversing the highest and most beautiful mountain passes. The views from the top of a mountain are always beautiful and mountain passes allow motorized travelers to experience them. Even if you’re not fit enough to hike to the top of a mountain with your backpack on you. Mountain roads also provide a great driving experience. 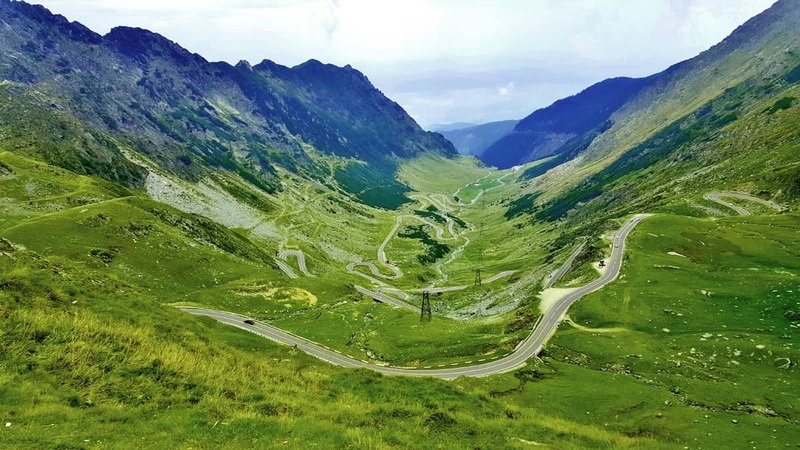 When the road is of good quality – and it is on the Transfagarasan – hitting the curves and switchbacks can be a lot of fun! There is no shortage of mountain passes in Europe but the Transfagarasan is special. 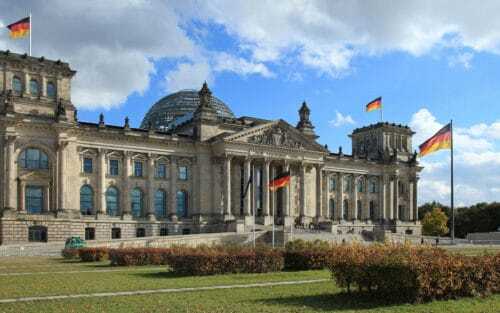 Possibly because it was built relatively recently – in the 1970’s – by a megalomaniac communist dictator – Nicolae Ceaușescu – to serve for military purposes. 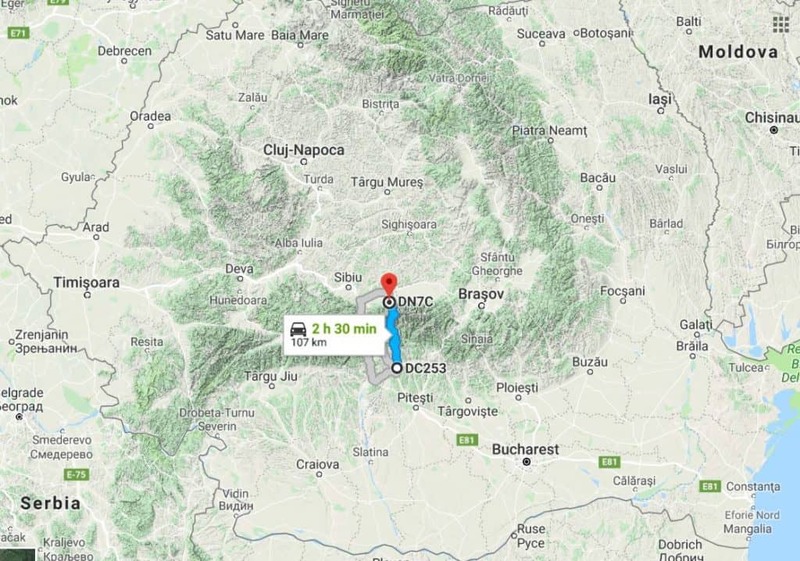 Which means that unlike mountain passes in the Alps, this is not an ancient route but a relatively new one, brazenly cutting through Romania’s Carpathian mountains. The greatest road in the world. Now, as much as I loved driving the Transfagarasan, in my humble opinion it’s not that vastly different from many other wonderful mountain passes. So yes, by all means, do it if you’re in Romania. I wouldn’t fly all the way to Romania just for that though. Fortunately, the entire region of the Carpathians is so gorgeous, there’s plenty to do other than drive this road. Where is the Transfagarasan Highway? 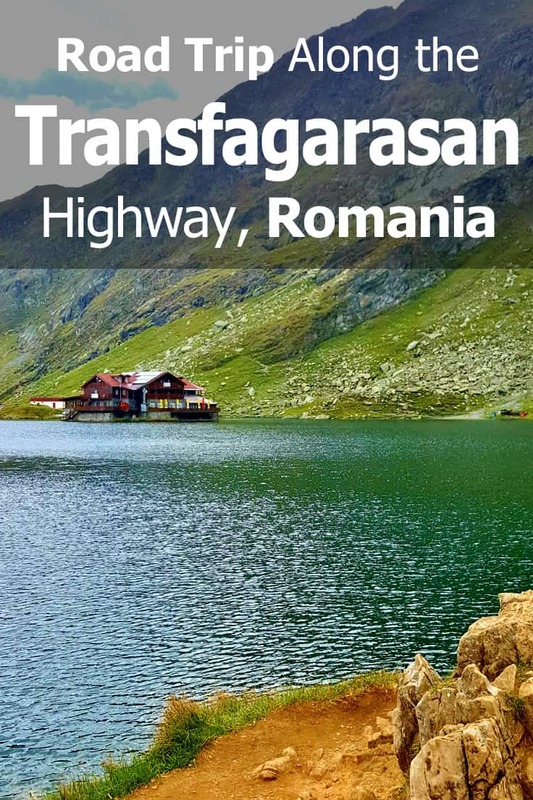 The Transfagarasan is in Romania. It goes from south to north through the Fagaras mountains which are part of the Carpathian mountain ridge. Hence its name – Trans-Fagarasan. Driving from Bucharest, it would take you approximately two and a half hours to get to the southern entry point of the road. Mind you, there is no actual mark for that. I just used the village of Corbeni as a handy mark. North of that point, you basically begin climbing the road into the mountain ridge. What if you don’t have a car? As far as I can tell, there is no public transportation along the highway, or even to the villages lying just south of there. If you’re adventurous enough, you could hitchhike your way along the road. Hitchhiking is legal in Romania and we’ve seen people stop to pick up passengers. Personally, I think that if you have a driver’s license, you should just rent a car for a couple of days and enjoy the drive. Another option would be to join a guided tour. 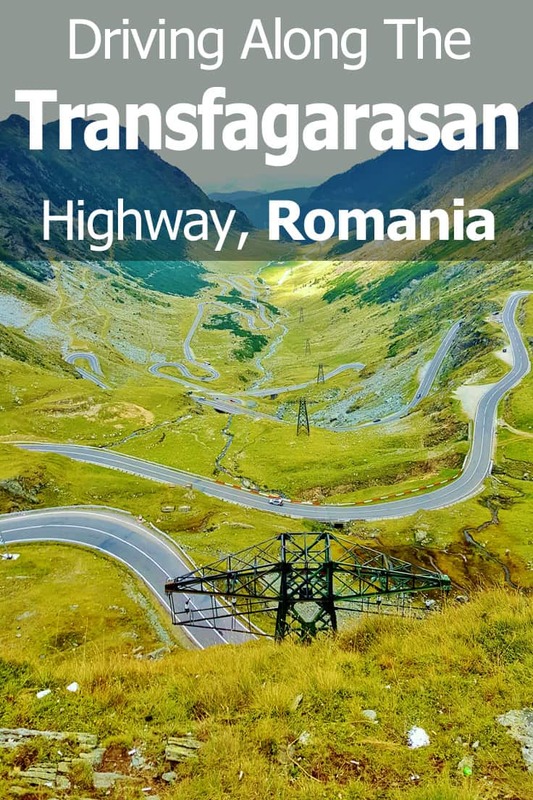 There are plenty of options for single day tours of the Transfagarasan highway from Bucharest, as well as from nearby Brasov and Sibiu. These trips cost between $50-$150 per person. Just Google to find them according to where you’ll be staying. Last, but not least, you can take the cable car to the top of the ridge. More on that when I talk about Lake Balea further down this post. 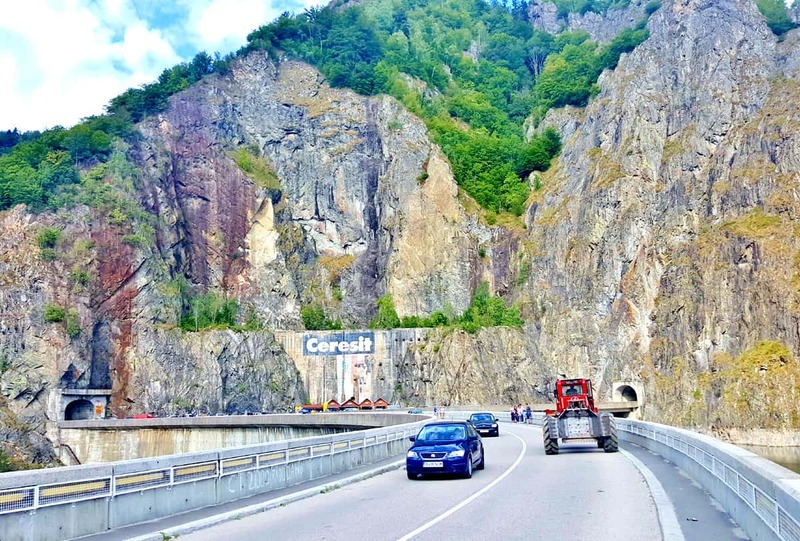 How long is the Transfagarasan highway? That depends. According to Wikipedia, the road officially begins in the village of Bascov near the town of Pitesti and ends at the crossroads between DN1 and Sibiu. Wiki claims that puts the total length of the road at 56 miles or 90 kilometers. I think they’re wrong about the distance there. 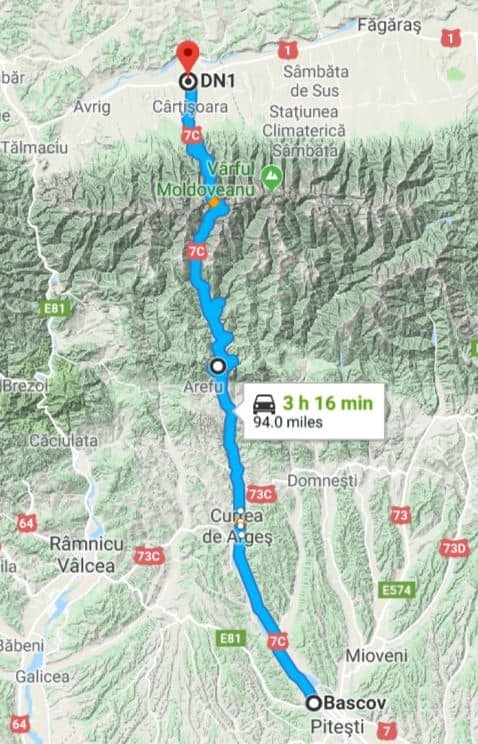 According to Google maps, that would be 151 kilometers or 94 miles. It really doesn’t matter that much. The challenging and beautiful part of the road is shorter than the distance between Bascov and the DN1-Sibiu junction. As I said before, that part of the road begins near the village of Corbeni and ends just before the village of Cârțișoara. That part is indeed about 90 kilometers (or 60 miles) long. 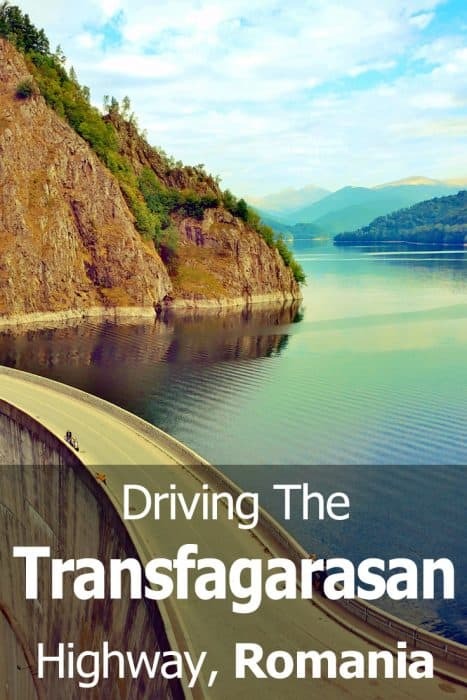 How long does it take to drive the Transfagarasan? Three hours is a good estimate for the stretch of the road we just mentioned (the 60 miles long bit). However, there are some great stops along the way. At least two of them justify getting out of the car for at least 15 minutes, possibly longer. Also, on a busy weekend or holiday, you should allow for longer driving times. There are no bypass lanes along this road (except for the very northern part) and taking over can be very dangerous. You may need to drive slowly behind other cars, so don’t be pressed for time. All in all, I think 4-5 hours would be a good time frame for driving this road. When is the Transfagarasan road open? The Transfagarasan is a mountain pass in Europe so naturally, it gets snow during winter time. The Romanian road authorities close the road for traffic between November 1st and July 1st. Those are the official dates. If they’re getting snow earlier than expected, they’ll close earlier. If the road is clear and the weather is good, they may open earlier in June. 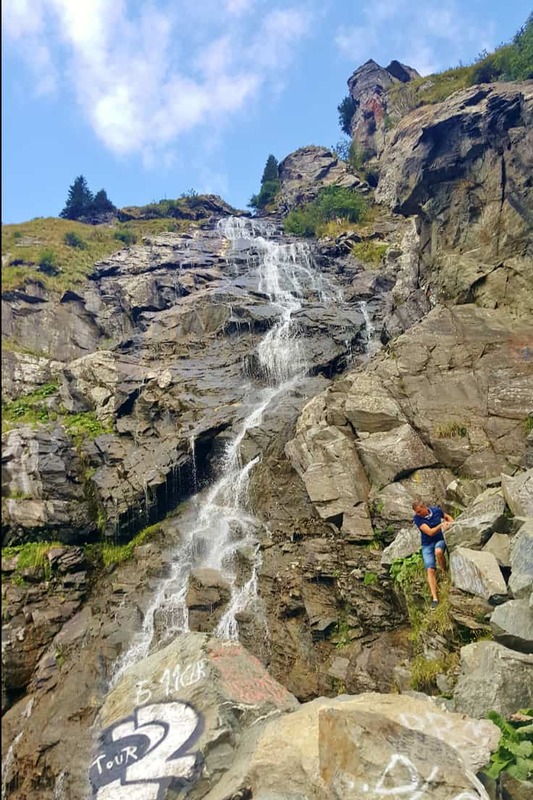 How to find out if the Transfagarasan is actually open? Use Chrome browser to go to this page. That would give you the current road status. 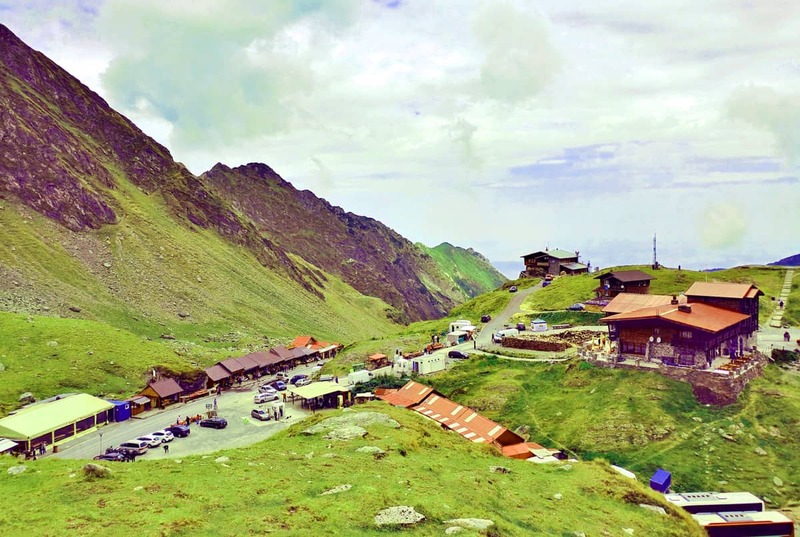 Is driving the Transfagarasan dangerous? The Transfagarasan is as safe to drive as any other mountain road. If you’re not used to mountain driving, it could be a “white knuckles” sort of experience. Lots of switchbacks and curves, so you have to keep your hands on the steering wheel and your eyes on the road. Unfortunately, the road seems to attract a lot of sports car. Some of these drivers seem to think they’re Jeremy Clarkson himself, trying to drive as fast as they can along the curves. On the plus side, at least they’re fast and don’t block your way. All in all, the road didn’t feel particularly unsafe to me. It actually felt safer than driving on some Romanian roads. At least on the Transfagarasan people drive more slowly. On other roads, it seemed like Romanian drivers just hit the pedal and take over your vehicle, with utter and total disregard for road conditions. Which way to go along the Transfagarasan road? Southbound or northbound, that is the question. Our flights were to and from Bucharest. 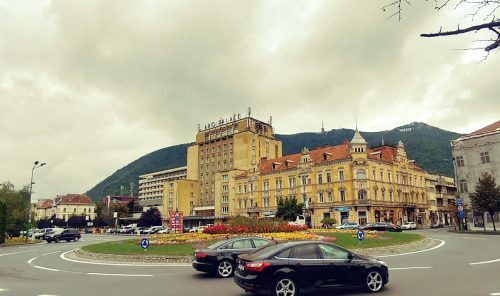 My first plan was to spend our first few days in the Transylvania area and then drive along the Transfagarasan, from north to south, on our way back to Bucharest. Then I noticed that would mean driving the highway on a Sunday. 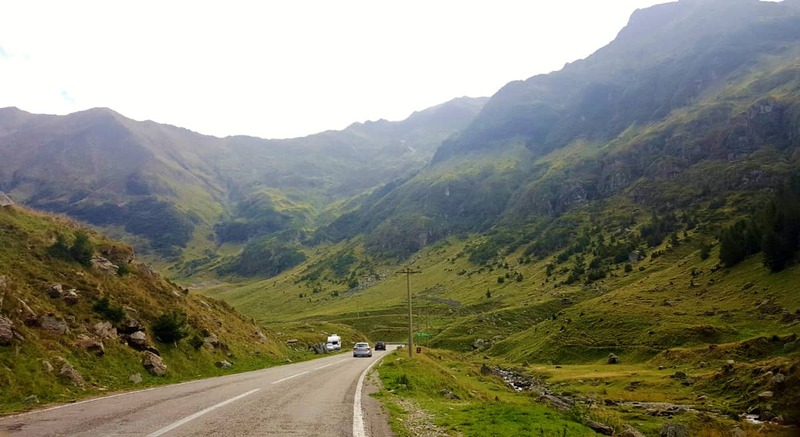 So, I changed the plan and we drove the Transfagarasan on our second day in Romania, and then spent the rest of our trip in Transylvania, before returning to Bucharest. As far as I could see, it really doesn’t matter whether you drive the Transfagarasan Highway from north to south or from south to north. Just see how the drive works within your overall itinerary and decide by that. If you’re driving and sightseeing, there are four recommended stops along the way. 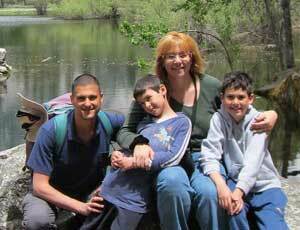 If you’re a hiker, then there are plenty more. You could literally spend weeks hiking in the Fagaras mountains, staying in the guest houses along the road. For the purposes of this post, I’ll focus on the points of interest for those driving along the road. 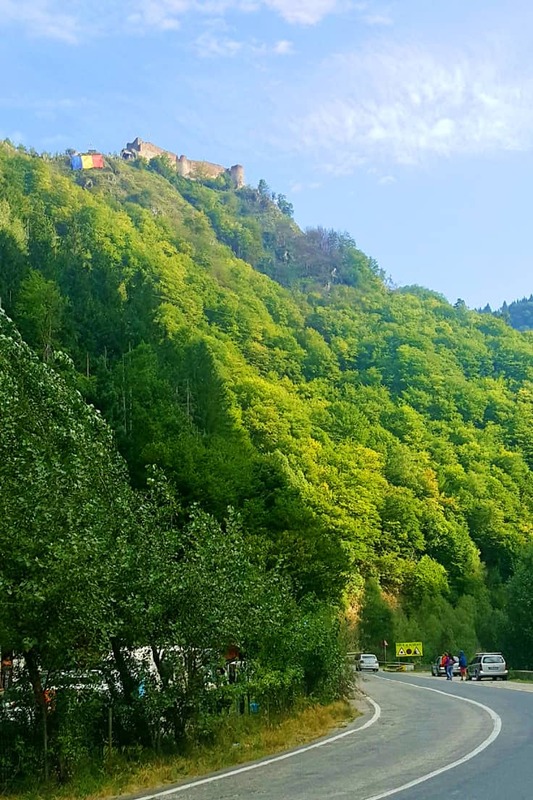 Also known as the Poenari Castle, these are the ruins of an impressive 13th-century castle, located at the top of one of the mountains near the road. You can actually climb all the way up to the castle if you’re up to traversing the 1480 concrete steps. We didn’t so I only have photographs of the castle from the road. 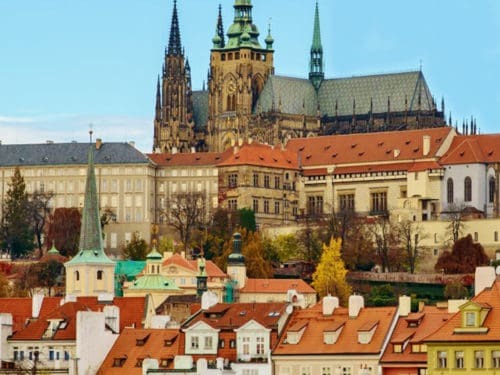 The castle belonged to none other than Vlad Tepes, aka Vlad the Impaler, aka Dracula. 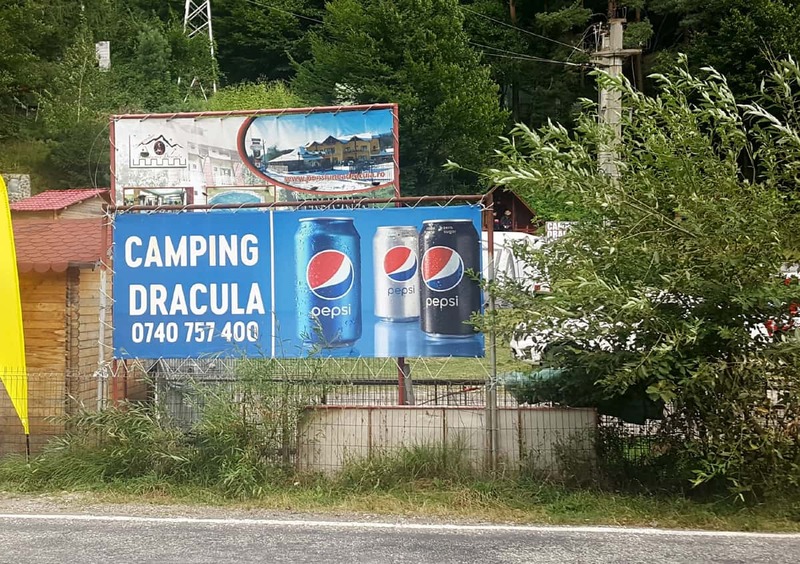 If you want to stick around for a day or two and do some hiking, there’s a Dracula campground near the road. I think this was the first Dracula-themed thing we saw during our trip, but most certainly not the last one! A clear sign that we were in Transylvania! Just north of the citadel, you’ll drive through a tunnel which will get you to Vidraru Dam. This impressive concrete dam is 166 meters high and over 330 meters long. It was built in the 1960’s to generate more electricity for the region. 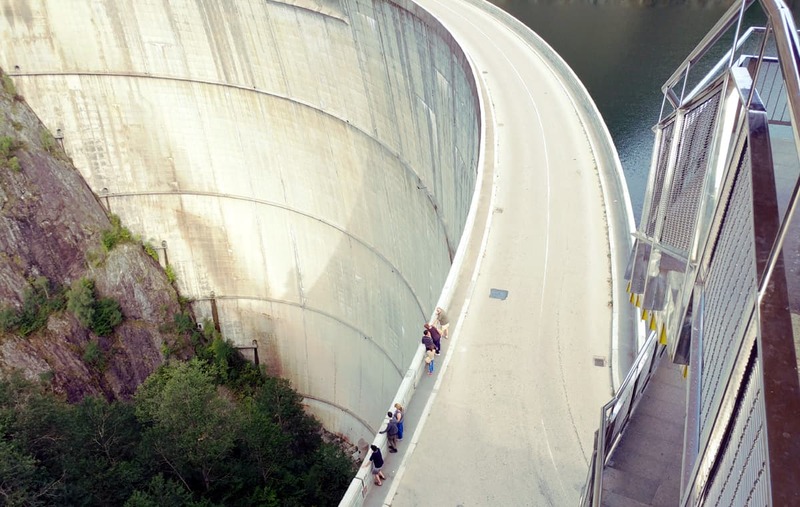 Today, you can – and should – stop your car next to the dam and walk along it. It’s totally beautiful! 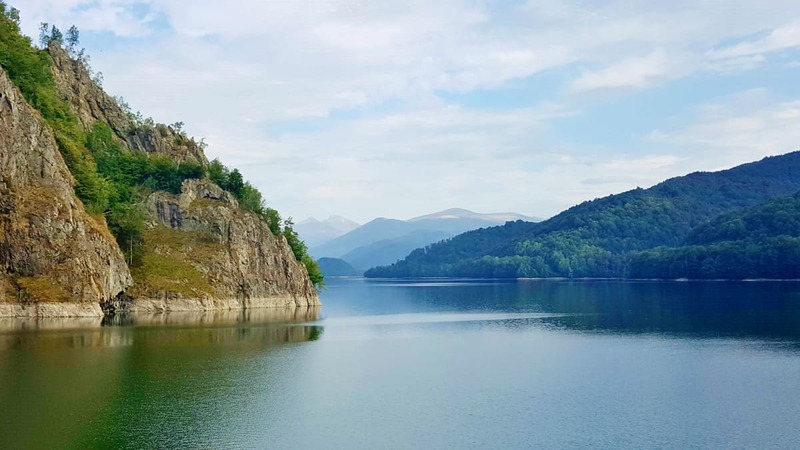 The river flooded the northern side of the dam, creating a gorgeous new lake, nestled between the Carpathian mountains. There’s an observation building right next to the dam. Visitors can climb several floors to get an even better view of the dam. There are several food stands right by the dam. We got some drinks and snacks – very fair prices for the location but then again that’s the case all over Romania. There isn’t a lot of parking though. It was enough for us when we showed up at around 10 AM on a regular weekday. By the time we left, half an hour later, people were struggling to find a spot next to the food stands. I can only imagine how crowded it gets over the weekend. There is some kind of overflow parking right before and after the dam, so I’m sure you can manage anytime – don’t miss out on stopping here. 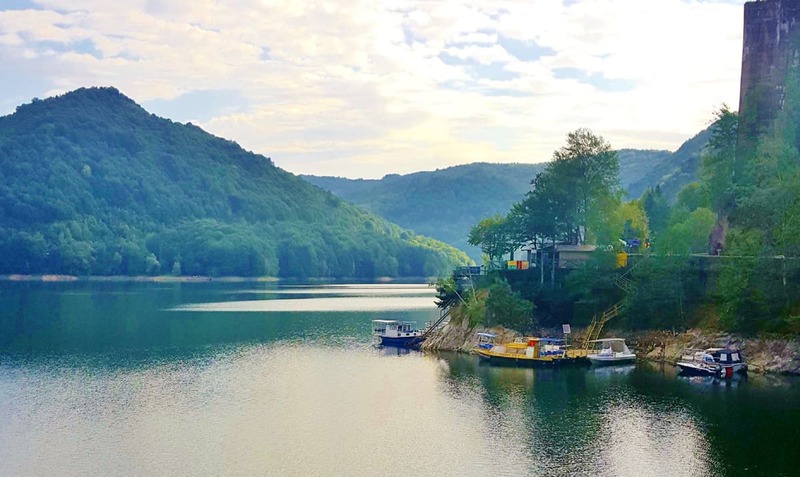 After stopping at Vidraru dam, you’ll find yourself driving through the surrounding forest for about half an hour or so, as lake Vidraru is to your left. Then the view opens up as you begin your climb up the mountains. In the middle of the climb, you’ll get to your next stopping point: Capra Falls, aka Cascada Capra. Again, there’s not a lot of parking space. Even less than by Vidraru Dam. The road is fairly narrow at this point and there are several food stands right by the falls, selling all kinds of cheese and sausages. 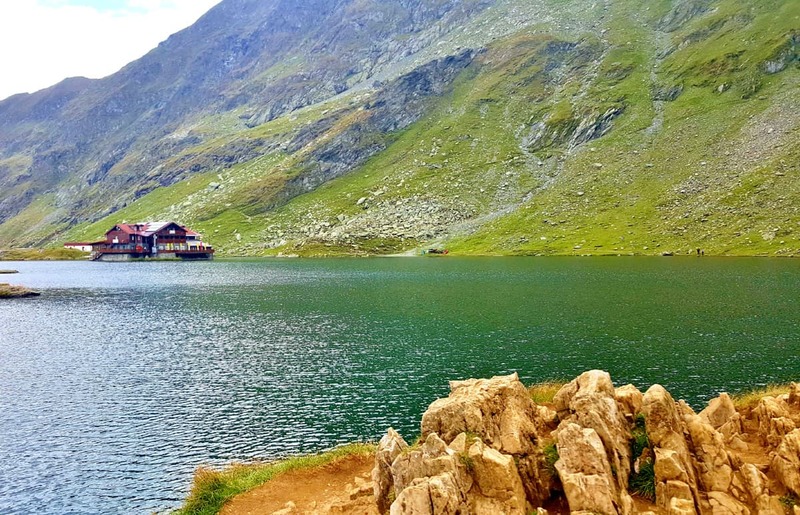 As you keep climbing the road, you’ll finally get to the next major point of interest along the road: Balea Lake, or Lacul Bâlea or Bâlea Lac in Romanian. This is an Alpine lake at the very top of the ridge. There’s a parking lot here. You pay 5 lei (approx. $1) for an hour but that’s plenty of time to walk around, enjoy the lake and even stop in one of the restaurants for lunch or coffee. The Lake Balea area is a ski resort during winter time, so there are two chalets there that are open year around. The road may be closed in winter time, but there’s a cable car line going down the mountain to the north. While the area feels commercial, with so many food stands and restaurants (well over a dozen), it’s easy to walk around for some fantastic views. If it rains, there’s a small observatory with glass walls from which you can view the area and get your photos. It costs 2 lei (about half a dollar) to enter the structure. And yes, you’re going to be driving down these switchbacks all the way down to the end of the road! This road can get busy, especially on weekends, so it makes sense to get an early start for your drive. That means you should stay close to the beginning of the road the night before. 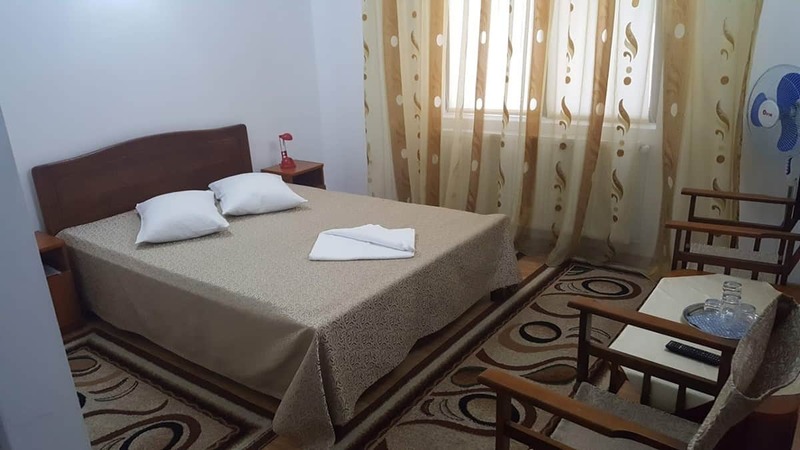 If you’re driving the Transfagarasan from south to north, you can stay in any of the villages between the small town of Curtea De Arges and the village of Corbeni. There are plenty of small guest houses, locally known as Pensiuneas. You don’t have to make reservations – you can just stop at any of them and ask if they have room. I preferred to book ahead since this was our first time in Romania. Also, I prefer to read reviews in Booking.com before reserving our rooms. 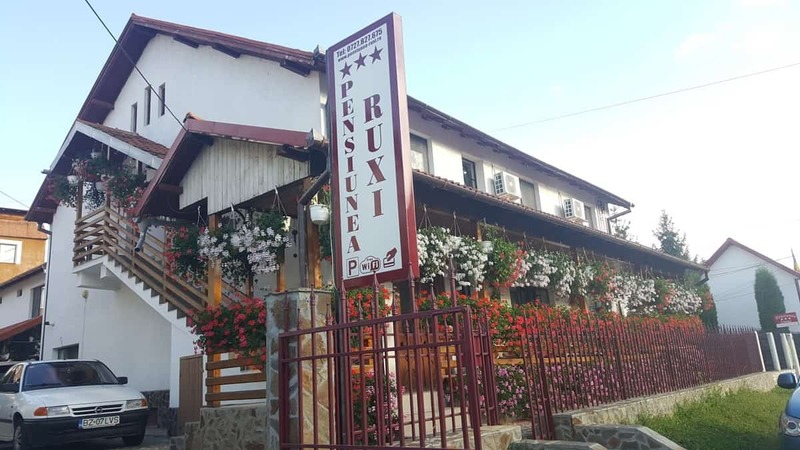 We stayed at a lovely place called Pensiunea Ruxi. We had two rooms (traveling with our boys) and they cost us a total of $59 for the night. Both rooms were lovely, simply furnished and clean, and we had use of a communal kitchen too. Our hostess was absolutely wonderful. Probably the most welcoming hostess I had ever encountered – anywhere. She was so friendly and went out of her way to help us in any possible way. The link to Ruxi’s is an affiliate link but I can whole-heartedly recommend it. And if you want to keep looking for accommodation in the area, I’d appreciate if you could do it through this link too. Thank you! If you’re driving the Transfagarasan from north to south, a good place to stay the night before will be Cartisoara. Of course, you can also stay in one of the places along the road – that would be a good choice if you want to take more time for hiking. 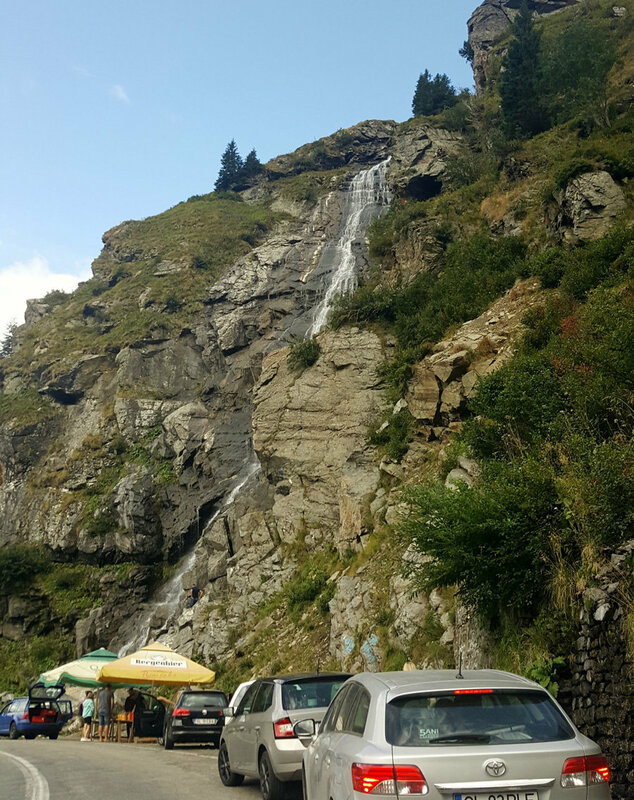 We loved our drive along the Transfagarasan and our trip to Romania. If you have any questions at all about this destination, leave me a comment and I’ll do my best to answer them. Also, if you can help me out by sharing this post on social media, that would be awesome – and thank you in advance. Here are a couple more Pinterest images if you need them. Next PostIs It Safe to Travel to Romania?